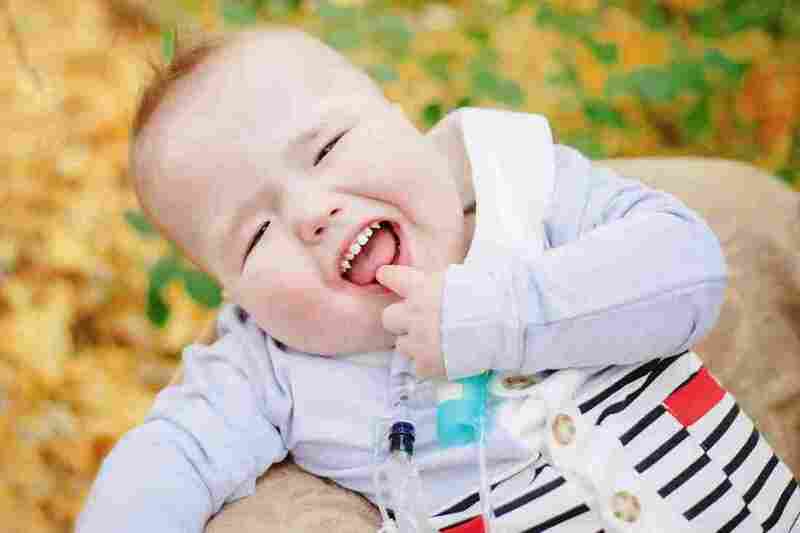 Baby Thrives Once 3-D-Printed Windpipe Helps Him Breathe : Shots - Health News Michigan doctors used 3-D printing to custom-make a splint to prop open Garrett Peterson's defective windpipe last January. He's home with his parents this Christmas, as "normal life" begins. Jake and Natalie Peterson and their son Garrett in October 2014. Garrett Peterson was born in 2012 with a defective windpipe. It would periodically just collapse, because the cartilage was so soft, and he'd stop breathing. This would happen every day — sometimes multiple times a day. "It was really awful to have to watch him go through his episodes," says his father, Jake Peterson of Layton, Utah. "He'd be fine and then all of a sudden start turning blue. It was just like watching your child suffocate over and over again." It was so bad that Garrett couldn't leave the hospital; he spent more than a year in intensive care. This time last year, doctors weren't sure how much longer they could keep him alive. "Garrett was so sick in the hospital and we — we really, really thought we were going to lose him," remembers his mother, Natalie Peterson. "The doctors were telling us, you know, that there really wasn't anything more they could do." 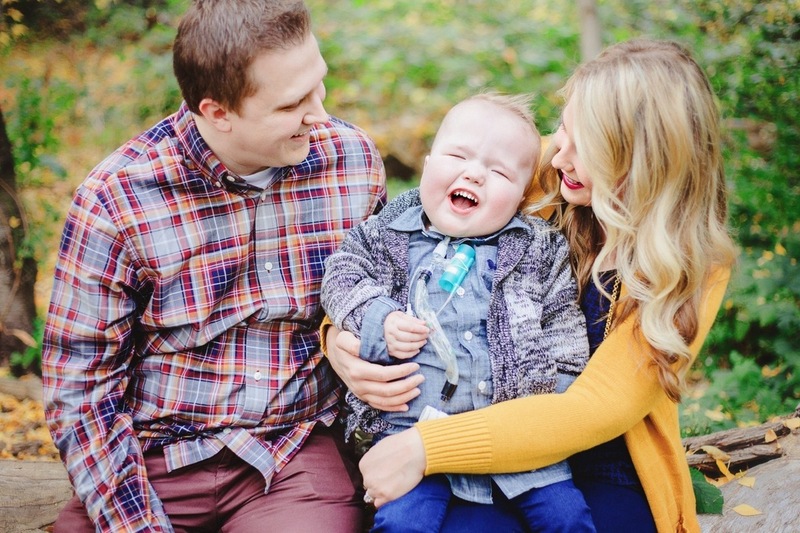 Then the Petersons heard about some doctors at the University of Michigan who were using 3-D printers to custom-make tiny devices they call "splints" to prop open defective windpipes for babies like Garrett. The Petersons rushed their son to Ann Arbor. When Shots first reported this story back in March, Garrett had just gotten his splint, and it seemed to be working really well. But at that point, he was still in the hospital. "We never knew if we would be able to get Garrett home. To be able to see him just napping — breathing comfortably on the floor in our family room — it was just overwhelming." Two weeks later, he was finally able to leave the hospital for the first time in his life. Since getting home, Garrett has still needed some help, especially at night, his parents say. But he's getting better every day. "He can breathe — like, on his own completely," says Natalie Peterson. "It's so nice just to hear him breathe ... to be able to hear him take big deep breaths and things that we never knew he'd be able to do." Other physical problems Garrett was having have also improved, such as complications with his heart and digestive system. "It's just been amazing to see how much it's helped him," Jake says. "It's just been completely night and day." The Petersons have started living a normal life with their son — they can now do things like roll around with him on the floor, read him books on their laps and laugh together at his favorite Mickey Mouse videos. Natalie remembers a moment recently when Garrett fell asleep on the floor of their family room, which was dark except for the lights on the Christmas tree. "I was sitting there thinking, 'Wow,' " she says. "We never knew if we would be able to get Garrett home. To be able to see him just napping — breathing comfortably on the floor in our family room — it was just overwhelming." Dr. Glenn Green, a pediatric head and neck specialist who treated Garrett, says he expects that the boy will continue to improve. Garrett Peterson in October 2014. "We know the splint has been opening up the way that we wanted," Green says. "And so the airway is able to grow. So, at this point, we're just waiting for further growth to happen and for the splint to eventually dissolve." Another boy Green had treated earlier, on an experimental basis, and a third baby who got a splint a few months after Garrett are also doing well, Green says. So he's now working to get his 3-D-printed windpipe splints officially approved by the Food and Drug Administration, which he hopes will make it easier to help even more babies. "I'm just extremely pleased to see the children doing well," Green says. "It just is the most rewarding thing for a physician — to see somebody that had never been home from the hospital now able to enjoy the holidays. I couldn't ask for a better present." The Petersons are looking forward to Christmas, too. "We're just so, so excited to have him home and to able to, you know, spend Christmas morning in our pajamas — just hanging out in our family room," Natalie says. "It's going to be great."